A programme paying tribute to Joe Loss, the undisputed doyen of big bandleaders. Joe Loss was the undisputed doyen of big bandleaders. His name was synonymous with the very best in dance band music. Loved and respected by his public and profession alike, he had a style and musical policy that kept him at the very top of the big band world for 60 years. Joe was born Joshua Alexander Loss on June 22nd 1909. He was trained as a classical violinist from the age of 7 and gave his first solo concert when he was 10 years old. Loss started band leading in the early 1930s, working at the Astoria Ballroom and soon breaking into variety at the Kit-Kat Club. 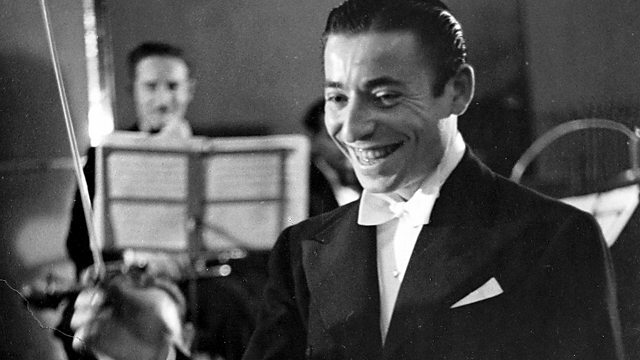 With broadcasting, recording and annual tours in addition to the resident work, the band became highly popular over the next few years; by 1937, he had become the biggest name in the world of big band music. Vera Lynn gave her first broadcast with the band in 1938 and when Joe married Mildred Blanch Rose at London's Great Central Synagogue that year, the crowd scenes in central London were akin to the Beatlemania of the 1960's- the wedding was even filmed for the newsreels. In April 1951 Elizabeth Batey, vocalist with Joe Loss, fell and broke her jaw. Joe was badly in need of a replacement and remembered hearing Rose Brennan on the radio during a visit to Ireland. Within days he had located her and, before a week was out, she was in Manchester rehearsing with the band. She stayed with Loss for fifteen years; one of her co- vocalists with the orchestra from 1955 was Ross MacManus, Elvis Costello's father. In 2010 the Joe Loss Orchestra celebrated its 80th anniversary - it is now Britain's longest running live entertainment unit of all time.